As in a little re-cappage for everyone. I know it probably appears I’m asleep at the wheel here, but truth be told, I just haven’t found the time to update the site. SO, here’s five small updates of things I’ve been into. Hope you enjoy. 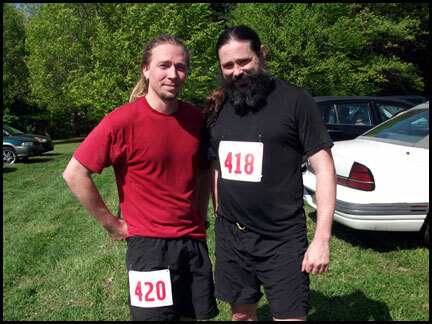 On April 24th Robert and I ran in the Trail Dawgs Half Marathon. This was our fifth (I think) year participating. This also happened to be my personal best time for the half marathon, finishing up at 2H 12M 36S. I know it’s not fast compared to some other people, but it was fast for me for 13.1 miles. If you look at the picture you can see my number for the race, 420. 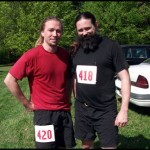 Ha, it felt like a joke being the guy with dreadlocks wearing the 420 number, haha. After the race we tried a 5 year old Sly Fox Odyssey and a Stone Black IPA (forget the name). Then we made a pit stop at Twin Lakes Brewery to see what was new there. Overall it was a good little morning. The day after the Trail Dawgs run on April 25th was the results for the DUH Homebrew Competition. DUH is Delmarva United Homebrewers, and it was only open to homebrewers in the Delmarva area. The cool thing about this competition was the grand prize was Dogfish Head Brewery would brew your beer on the brew pub system, which is an 8 barrel capacity. So the only real criteria was to enter something creative that DFH didn’t already make something similar to it. I entered the Belgian Dubbel infused with Chinese Five Spice, or Dubbel Dragon as Erik started to call it. 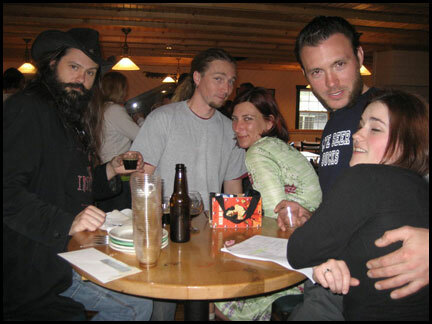 It didn’t win, but we had a great time sampling all the other homebrews available at Dogfish Head’s upstairs room. I think something with ginger and lemongrass actually won. 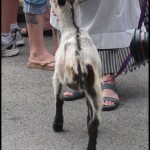 The following weekend saw more stoopidity, because on May 2nd was the Sly Fox Goat Races. These are always a ridiculously good time. This year was Sly Fox’s first year at the new location, like seriously open less then a week at this point. The people really showed up in numbers with goats, and kids, and dogs, and beers just about everywhere. This year also saw a first in a back-to-back repeat winner, Dax. So once again we had the Dax Maibock poor at the end of the festivities, and it was delicious. 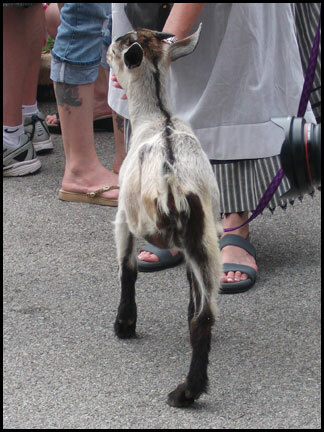 In the bad picture to the left you can see the little goat I wanted to win, her name was Peggy, and she had three legs. Peggy made me smile and I wanted her to win, but alas it wasn’t meant to be. Another good thing happened later that week, on May 6th I received my first new shipment of ingredients in quite some time. I had already arranged things so that I had around 150 lbs of base malt, and still lots of extra hops from the order that was placed for the 1oth Anniversary Batch, but now I needed more specialty ingredients so that I could make a more diverse line up of beers. So I ordered enough for seven batches plus, and they are: an American Wheat, an American Brown, a Saison, two different Pale Ales, and two different IPAs. All of these will be 10 gallon batches, and realistically all of these should be brewed by the end of the summer. 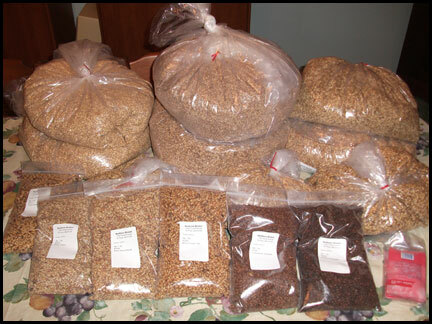 There should be enough “extra” specialty malts to squeeze out one or two hodge-podge beers too afterward, though I will probably need more base malt by then. 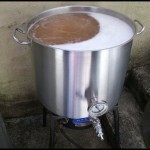 And finally on May 15th I brewed my first batch of been since the beginning of March, I think. I started with the American Wheat, all Perle hops, sort of based off of my Cluster Wheat recipe from last year. 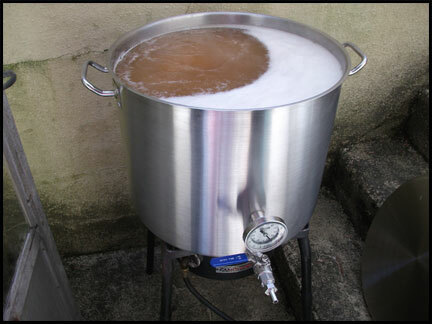 For this beer I believe I am going to keep 5 gallons traditional and then add fruit to the other 5 gallons. I was trying to think of something different but still appealing to try and then it hit me one morning at work. A Grilled Pineapple Wheat Beer. I know, it sounds funky, but it also sounds summery, and I think it may just have a chance. I think the grilling will add a cool caramel flavor and will mellow out the pineapple bite a bit. The other thought was similar, Toasted Coconut Wheat Beer, but unfortunately I’m not a huge coconut fan and 5 gallons of that could be a little much for me. 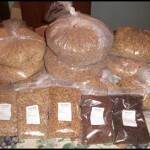 This entry was posted on Monday, May 24th, 2010 at 10:51 pm	and is filed under Beer, Homebrew, Side Trip. You can follow any responses to this entry through the RSS 2.0 feed. You can leave a response, or trackback from your own site. Me to!!!! And yes, I thought you went on a long vacation. Welcome back!